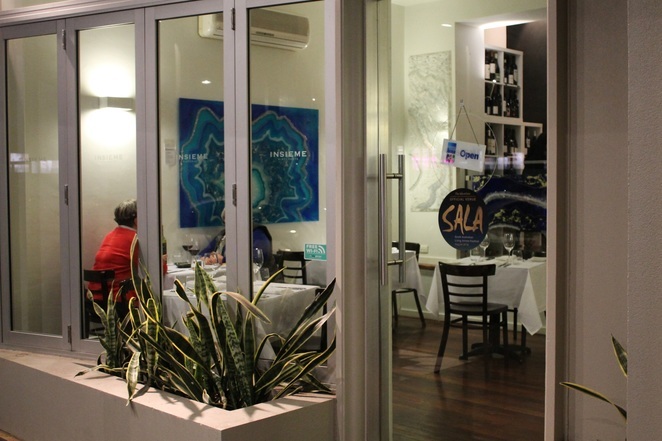 Insieme Ristorante offers a brightly lit and colourful interior. Author image. Revered French chef Auguste Escoffier once said, 'The greatest dishes are very simple'. This philosophy not only serves as a guiding light for Flinders Street gem Insieme Ristorante but appears as a quotation on its piatti del giorno (dish of the day) menu. I'd stumbled upon Insieme Ristorante on a brisk walk past the previous night, en route to somewhere else. Like a siren, this elegant yet discreet Italian restaurant called me back. Insieme Ristorante's warm, brightly lit interior, gallery-style artworks (many for sale), its traditional menu with contemporary flair and its deep Italian roots were irresistible. Pappardelle with slow cooked pork cheek. Author image. Antipasto options include oven baked calamari filled with breadcrumbs, herbs, pine nuts, parmesan and sugo ($20) and gnudi con tartufo, a ricotta and truffle dumpling, with wild mushrooms and crispy pancetta (also $20). 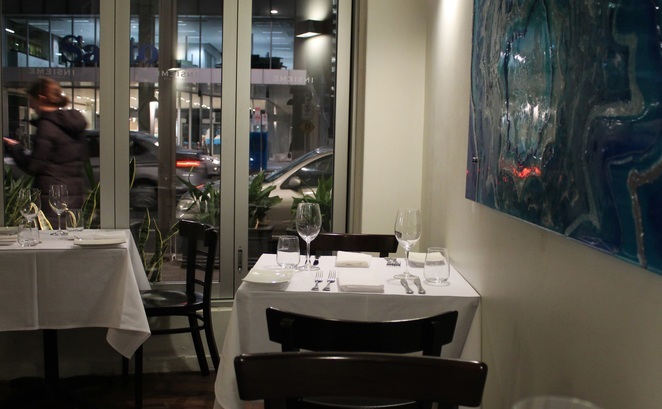 Insieme Ristorante offers small but selective range of pasta and rice dishes. And for mains, I had my eye on the venison osso bucco served over soft polenta ($36). Dessert? It's a toss-up between panettone with creme anglaise or ricotta and sultana almond torte with mascapone (both $14). Then again, the affogato ($17) is mighty tempting too. But when the piatti del giorno menu is placed in front of me I change my mind, instead opting for the papardelle di maiale ragu ($35). It was, as wait staff are wont to say, 'a good choice'. 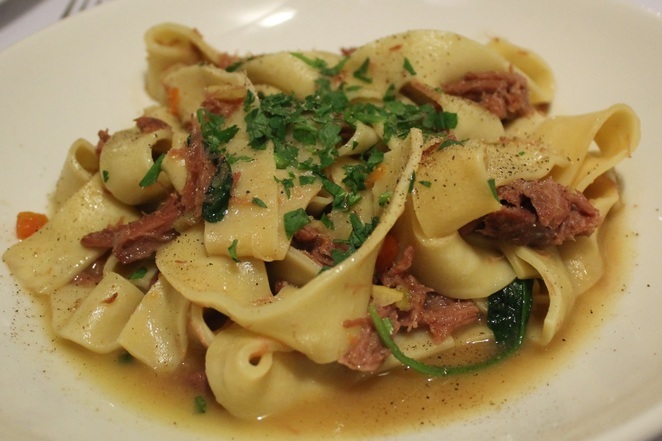 This dish featured fat ribbons of papardelle (hand-crafted, as is all the pasta here), melt-in-the-mouth slow-cooked pork cheek, little twists of baby spinach and the occasional tang of slivers of preserved lemon. The wine suggested as the perfect accompaniment to this dish (Claymore's 'Dark Side of the Moon' from South Australia's Clare Valley) was unavailable. So instead I opted for The Hedonist's shiraz, biodynamically grown in McLaren Vale (keeping it local at least). Rich, opulent and deeply satisfying, it lit a fire in my cheeks which warmed me all the way back to my hotel. Enjoy a leisurely meal. Author image. The calamari dish sounds wonderful.